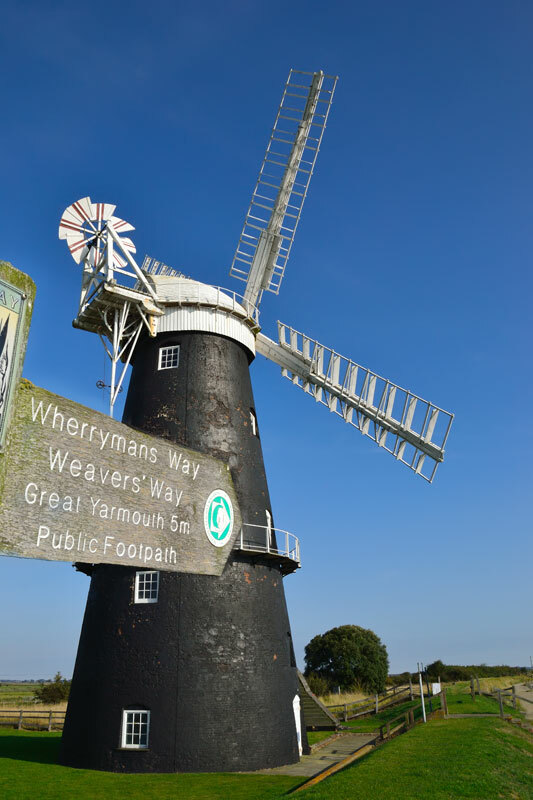 The Berney Arms Mill or wind pump is the tallest in Norfolk and stands over 70ft high. 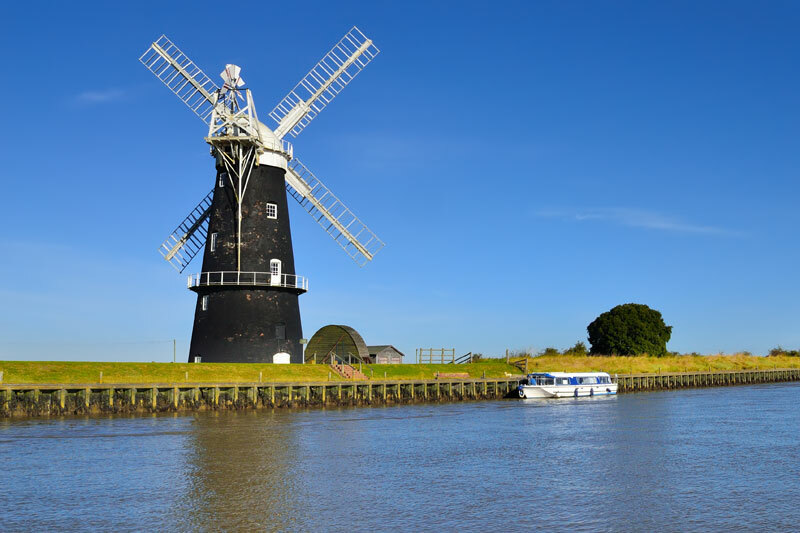 It dominates the River Yare near to the point where the Yare and Waveney meet at Breydon Water. Unlike a lot of the Broads windmills, Berney Arms mill was used to grind a constituent of cement. Later as evidenced by the scoop wheel it was used to drain the marshes. It is in the care of English Heritage, access to the mill is by pre-booked tour only. Berney Marshes and Breydon Water form the southern edge of the 6,000 hectares Halvergate Marshes. It is the second largest area of continuous wet grassland in the UK. 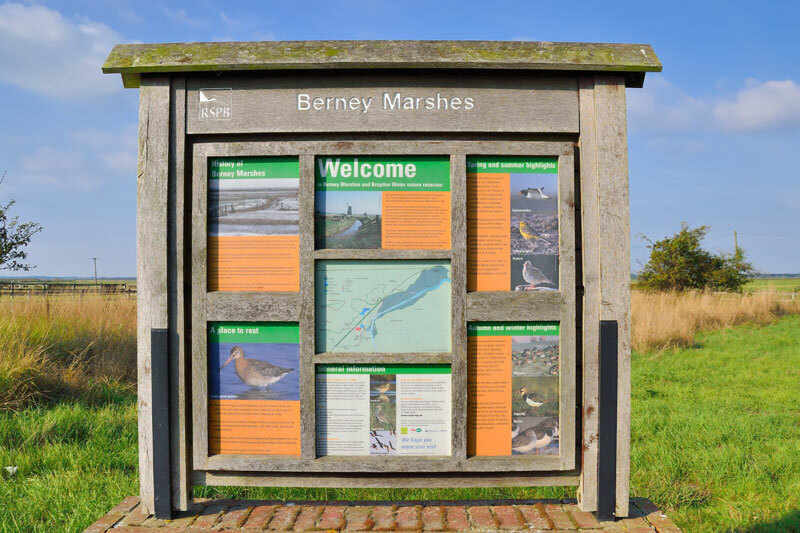 The marshes attract a large number of birds including Lapwing, Common Redshank and Common Snipe. 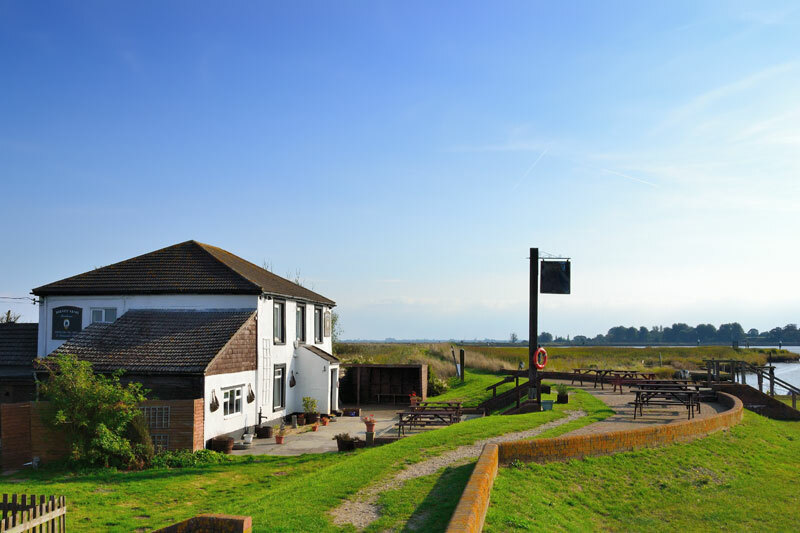 Berney Arms is an ideal place to moor while waiting for low tide at Great Yarmouth. The tide flows fast here with a rise and fall of 4ft. It is the first safe mooring after crossing Breydon Water from Yarmouth and the last safe mooring before crossing Breydon Water if travelling from Reedham. Travelling time to Yarmouth is approximately 45 minutes. There are free Broads Authority moorings here for about 10 boats. The Berney Arms Inn is the most remote pub on the Broads, it is only reachable by boat, rail or foot there is no access by car. The pub is currently closed but there are moves to buy it and open it as a community run pub. In the summer of 2017 a café opened adjacent to the pub, they also manage the moorings for which a fee is payable. 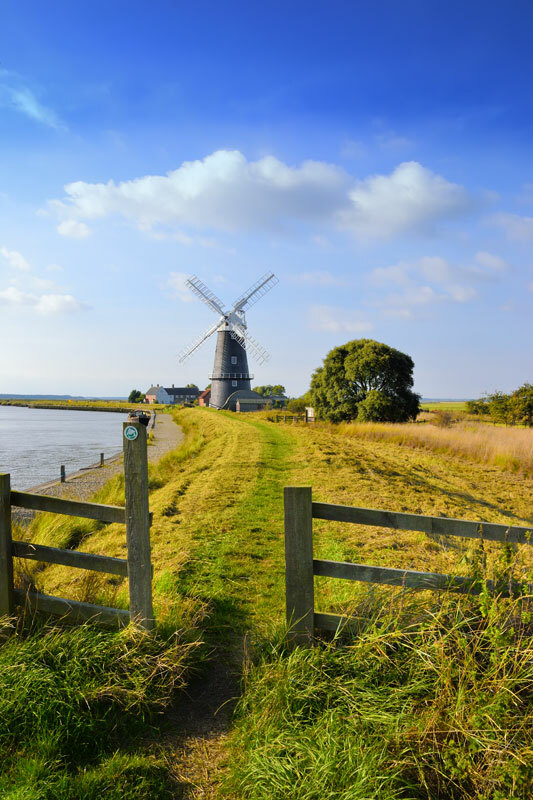 If you fancy stretching your legs you can take a 5-mile walk along the Weavers’ Way to Great Yarmouth, returning via train to Berney Arms station. It’s an interesting walk especially as you’ll see Breydon Water from a different perspective. Route finding is easy but there is a downloadable Weavers’ Way leaflet available. Check train times by visiting www.wherrylines.org.uk. 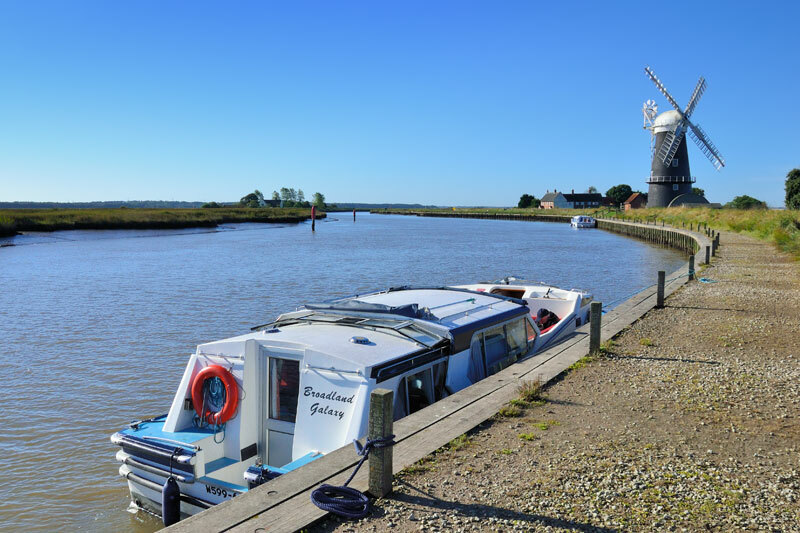 The Wherrymans’ Way is a 35-mile recreational route following the course of the River Yare between Norwich and Great Yarmouth. The Weavers Way is a 61-mile route linking Cromer on the north Norfolk coast with Great Yarmouth on the east Norfolk coast. On a long summers day if you’re heading for Acle you could split your crew, one half staying on the boat, the other half following the Weavers Way via Halvergate to the Bridge Inn at Acle, a 6 mile walk.